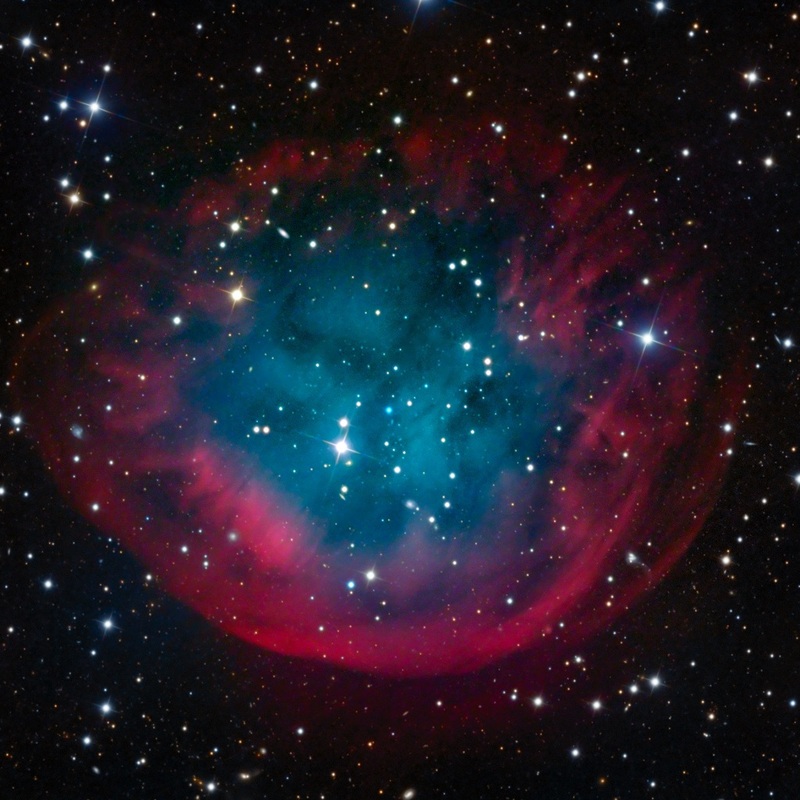 Abell 31 (also known as Sh2-290) is a planetary nebula of nearly ten light-years wide, located about 2,000 light-years away from Earth in the constellation of Cancer. Although it is one of the largest planetary nebulae of the sky, Abell 31 is not very bright. Despite their name, planetary nebulae have nothing to do with planets. The name of planetary nebulae arose in the 18th century because of the visual similarity between some round planetary nebulae and the planets Uranus and Neptune when viewed through small optical telescopes. Planetary nebulae represent the final brief stage in the life of a star with a mass up to eight times that of the Sun. While consuming the last of the fuel in its core, the dying star expels a large portion of its outer envelope. This material then becomes heated by the radiation from the stellar remnant (collapsing from a red giant to a white dwarf) and radiates, producing glowing clouds of gas that can show complex structures, as the ejection of mass from the star is uneven in both time and direction. The nebula will gradually disperse into space, and then the white dwarf will cool and fade away for billions of years. Our own Sun is expected to undergo a similar fate, but fortunately this will not occur until some 5 billion years from now. Abell 31 is such a very ancient nebula that its gas has already started to disperse into space. Its central star is a tiny white dwarf (about 4 times bigger than Earth or about 0.04 times the size of the Sun), which is incredibly hot, about 85,000° Celsius (150,000°F). It has about half the mass of the Sun, meaning it probably started out life as a star with about twice the mass of our Sun, and lost the rest as it aged and its stellar winds blew its outer envelope away. Judging from how fast those winds are blowing outward, the star probably started dying about 130,000 years ago, after a billion or more years of normal life. The nebula is moving through space at a relatively high speed. The direction of motion is toward the southern part of the cloud. This southern portion is sharply defined by a wide bow shock where the nebular gas and dust is compressed by the interaction with the surrounding interstellar medium. Gas heading in the opposite direction is moving downwind, and remains relatively untouched, making the northern boundary of the nebula rather diffuse. Note how this image shows both red and blue portions to this nebula. The red gas is hydrogen, and the blue is oxygen. The blue portion sits close to the progenitor star. The oxygen is probably located throughout the entire nebula, but only in the center is it close enough to the central star to get lit up and glow. This image was taken in December and January 2011-2012 with the 0.8 meter Schulman Telescope at Mt. Lemmon in Arizona.